This cathedral was founded in in 1140 and consecrated in 1148. 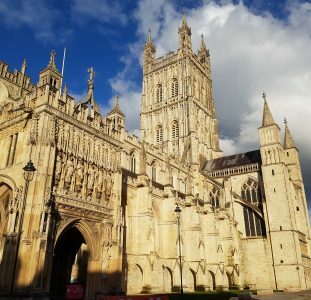 It was originally St. Augustine’s Abbey but in 1542, after the Dissolution of the Monasteries, it became the seat of the newly created Bishop of Bristol and the cathedral of the new Diocese of Bristol. The east end of the cathedral contains the oldest part of the building with the Elder Lady Chapel dating from the early 13th century. During the 14th century much of the church was rebuilt in the Decorated Gothic style with the central tower and transept being added in the following century. The new nave was incomplete at the time of the Dissolution of the Monasteries so was demolished. In the 19th century Gothic Revival, a new nave was built partially using the original plans. The western twin towers were completed in 1888. Bristol Cathedral is unique in the British Isles as it is the only example of a ‘hall church’ – this is where the aisles are the same height as the central nave. This is a common feature of German Gothic architecture.